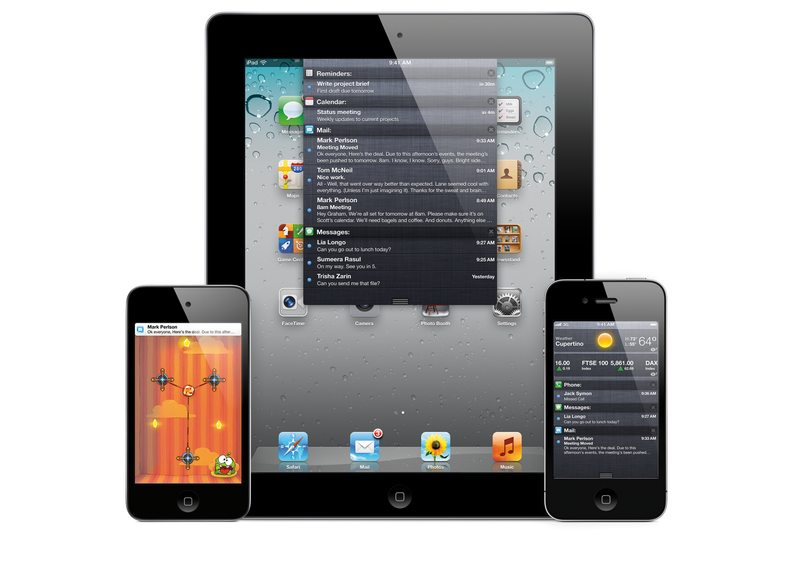 It's been more than a year since a major revision of iOS has been released. We're ALL waiting for iOS 5. We're also ALL waiting for the announcement of the next iPhone. Those who saw the iOS 5 announcement at the Worldwide Developers Conference in June can't wait until it arrives. And to this day, my most popular post is "What To Expect From iOS 4." It's probably not because everyone wants to read about an operating system that's more than a year old. It's because people are searching for hints about the NEXT operating system. I've held off going over all of the features of iOS 5 because we've been bombarded by them in the mainstream tech websites. So, now that all the hoopla is over and we're just waiting until Apple sets a date for its Fall Apple Event I guess it's time for me to remind you what we're all waiting for. This is probably the most wanted feature ever since the initial push notifications were added to iOS. While I still find pop-up notifications very useful, it is incredibly intrusive for many people. And since push notifications were enabled, I've been using Boxcar which is basically an app that keeps track of your push notifications and enables push notifications for other apps. I have been told by those who have the beta version of iOS 5 that you will be able to choose between the pop-up appearing at the top of the screen or the middle of the screen. I think the top looks much better and is a a lot less intrusive. There's also a stock and weather widget in Notification Center. Notification Center may have taken a cue from Android. If that is the case, then iMessage probably took a cue from BlackBerry Messenger. iMessage is basically text messaging through the Internet between iOS devices. iPhones can message each other without using up valuable text messages. iPhones can text iPad and iPod Touches with Internet connections and vice-versa. While apps like Beejive, Kik, and, to some degree, Facebook Messenger are trying to replace traditional communications via texting or emailing, iMessage just goes that extra step to providing a comprehensive text communications system to an entire platform of devices. I love this because I think this is the first step to someday not needing to pay for texting plans. I only purchase a texting plan for those who don't have smartphones and can only rely on texting. Text messaging in iMessage is only one of its features. You will also be able to send pictures, videos, locations and contacts. Group messaging is also supported. I wonder if you'll also be able to transmit audio files? Many messaging apps do provide that function. You can also track your messages with delivery receipts and optional read receipts. 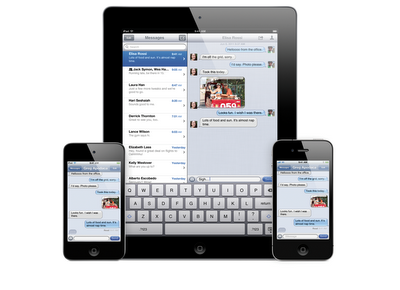 iMessage will also give you the flexibility to message on one device and easily switch to another. That's cool. Now, iMessage will be integrated into current Messages app. So, there might be some confusion at first. How do you know if you're using your texting plan or if you're using free iMessages? Well, the person you are messaging will have either blue or green bubbles. If they are green, like they are right now on your iPhone, you're using your texting plan with that person. If the person's text bubbles are blue, then you're using the free iMessage. Since I am a subscriber of at least two digital publications, I can't wait until the Newsstand feature is unveiled. It is basically the iBooks equivalent for newspapers and magazines. 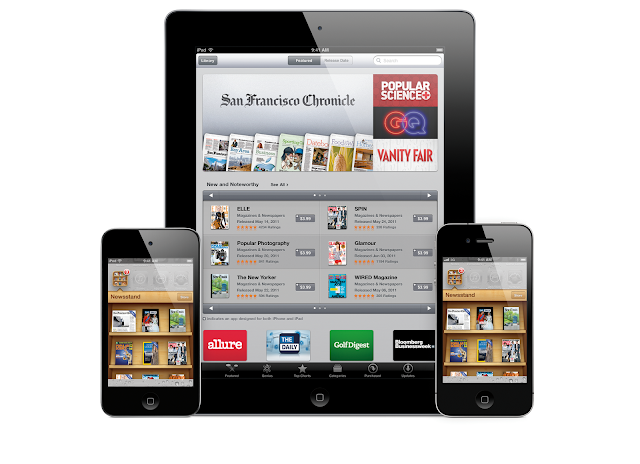 Right now, different newspapers and magazines for the iPad, iPhone and iPod Touch are separate apps. Each issue has to be downloaded separately by opening each app. (Although the recent Editions app for the iPad let you set when the issue can be downloaded in the background.) Especially when it comes to daily publications, this can be very tiresome. With Newsstand, all of your newspapers and magazines will all be in one app and each issue will be downloaded in the background as soon as they are ready to be "delivered." In the same app that you read the publications, you can also subscribe or buy more publications. Multiple digital subscriptions will be less of a pain and it will all be organized nicely in one app. 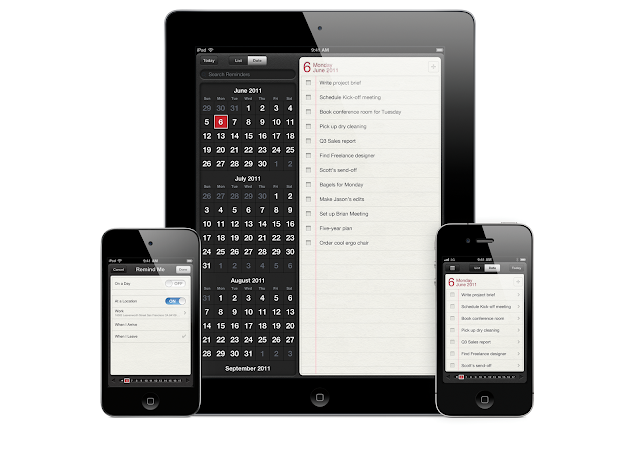 To-Do lists will be integrated into the iOS Calendar app with Reminders. Although it's nice not having to download another app to have to-do lists, the best part of reminders are the location-based reminders. If you pull into the supermarket parking lot, you can set a reminder to tell you something before you get in the door. You can also set a reminder as you're leaving a location so you won't forget to buy milk or some other task. Reminders can also sync with iCal, Outlook and the Calendar in the iCloud. Believe it or not, there are still many more features that I haven't mentioned here yet. There's a lot to take in as we get ready for iOS 5. After iOS 5 is released, I'll write some blogs about which new features I found particularly useful. To me, iOS 5 is trying to level the playing field with Android, BlackBerry and even Windows 7 Phone. While all of these features are not revolutionary, they are sorely needed in iOS to be successful and competitive. And somehow, Apple manages to take an idea that has been done over and over and make it new again. Hopefully, that is how iOS 5 will be.